Sorry for the hiatus, peeps. Hadn’t counted on (what I think is me dropping my electrolytes due to) refeeding syndrome – especially having deliberately loaded myself daily with a banana-shaped dose of the good stuff. Vitamins B1/2/3/6 & C – constituent parts of Pabrinex. Or I could have just subconsciously channelled all my energy to Mo Farah as he whizzed past our flat in today’s Virgin London Marathon. What a hero! In any case, one is feeling better after substantial quantities of chocolate (magnesium), OJ (potassium) and dairy (calcium) and now we soldier on. ‘Takka Takka’, Roy Lichtenstein 1962. The bit about tropical fungal infections may (or may not?) be an exaggeration. Everything else applies. Subsequent entries to be drip-fed here over the next few days. 2 patient chocolates (i.e. chocolates from patients, not chocolates who are very patient) – 2(0.20 each, based on current RRP of standard 420g Thorntons box) – 0.40. Of course I helped myself without paying, but for LBTL I am factoring in the actual cost I would have had to pay. Many of you have enquired about the rationale behind my choice of main protein. 4. I don’t know how to cook with lentils *sad face. Somebody please teach me? 3. To be able to namedrop Kevin Bacon. Obviously. One major factor in my choosing to undertake this challenge is my having been a long-time silent fan of this blog: Back to Sainsbury’s Basics. Basically (<— pun!) this guy is a friend of a friend – I think some of you know him in real life too. He writes up unpaid reviews of various products from the Basics range and works them into recipes. The blog is original, hilarious and utter genius. Please visit and be thoroughly entertained like I have been. This is my version of his version of Bacon Jam, which in turn is adapted from the also-brilliant Not Quite Nigella. I do not own the rights to the original recipes; all credit is given anywhere credit is due. 1. In a non-stick pan, fry the bacon in batches until lightly browned and beginning to crisp. Using a pair of scissors cut into 1 inch pieces. 2. Fry the onion and garlic in the rendered bacon fat on medium heat until translucent. 3. Transfer the bacon, onion and garlic into a heavy based cast iron pot and add the rest of the ingredients except for the water. Simmer for 2 hours adding 1/4 of a cup of water every 25-30 minutes or so and stirring. 4. 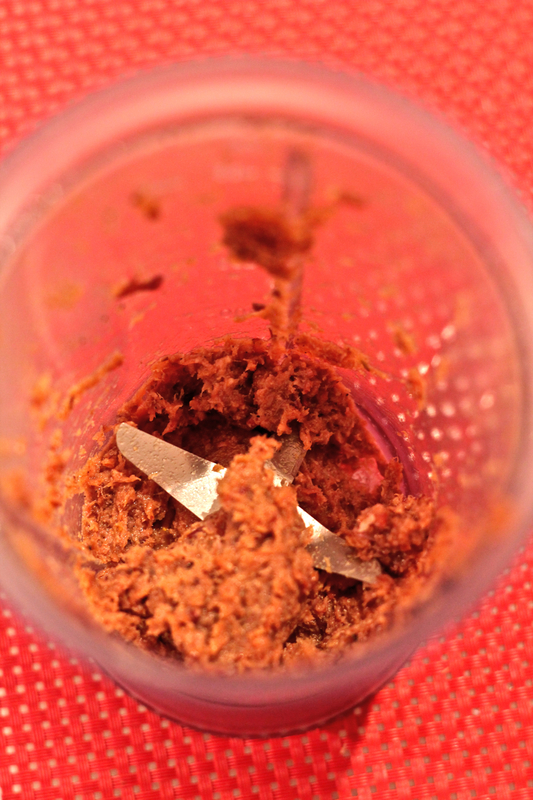 When ready, cool for about 15-20 minutes and then place in a food processor. Pulse for 2-3 seconds so that you leave some texture to the “jam” or of course you could keep whizzing and make it a smoother and more paste like. 2. No onion or garlic to fry. Too poor. So fry diced apple. Add beans. 3. Cast iron pot? One does not have enough spare energy while Living Below The Line to lift a cast iron pot. 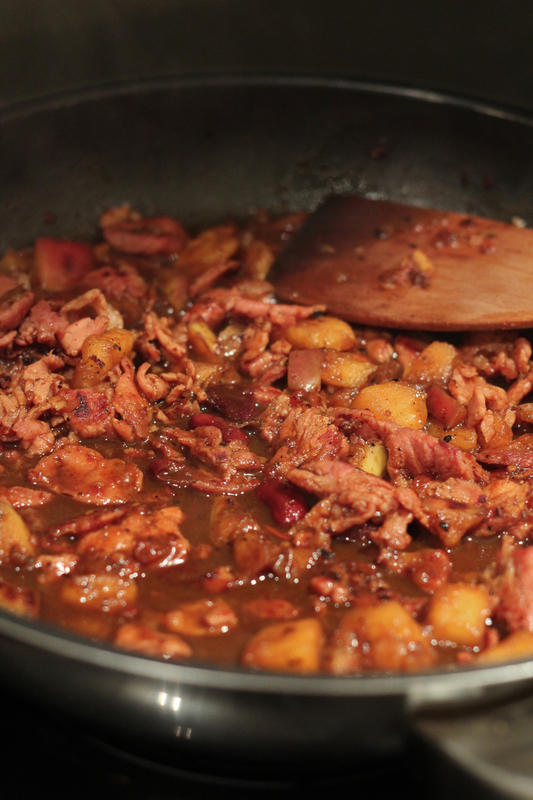 So – continue cooking bacon and apple in the same pan. Add sugar, coffee and chilli. Simmer for a long time, adding 1/4 cup tap water every half hour or so and continue stirring. 4. Theoretically one should not be able to afford electricity (or gas) for 2 hours. So take off heat after 1 hour. 5. Cool for 15-20 minutes. Pulse in food processor. 6. 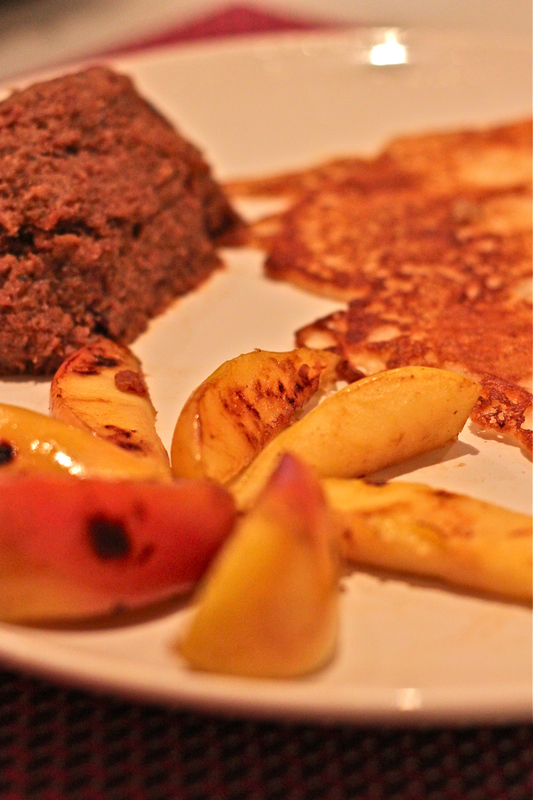 Serve up with eggless pancakes and pan-fried apple – see recipe below. Did you really think I was going to have bacon jam with rice? Makes 4 pancakes (2 servings). 2. Whisk milk in with dry ingredients. Rest batter for 2 minutes. 3. Take a fresh pan. Fry up some bacon that is meant to join the rest of the bacon jam later on. 4. Remove bacon, leaving rendered bacon fat behind. 5. Ladle a spoonful of batter into the pan. Oops. Not part of the plan. 6. Change tack, as that is the only way one is going to have any meaningful dinner. So – take pan to sink. Scrub the hell out of it. Dry pan. Ration out 1 tbsp of cheapest oil in the house (‘vegetable’) and add it to pan. 7. 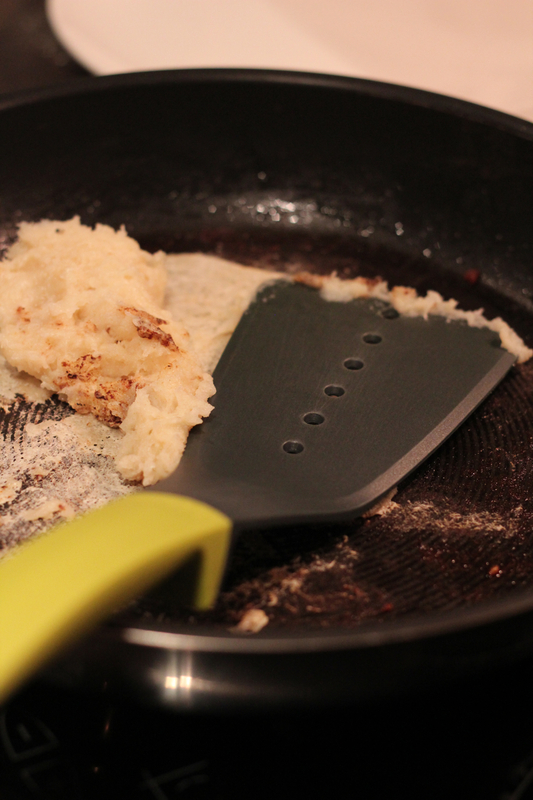 Cook pancakes as one normally would – spoon it out, wait for bubbles to appear on surface, flip over. 1. After frying up pancakes, add sliced apple to same pan (don’t wash it just yet). 2. 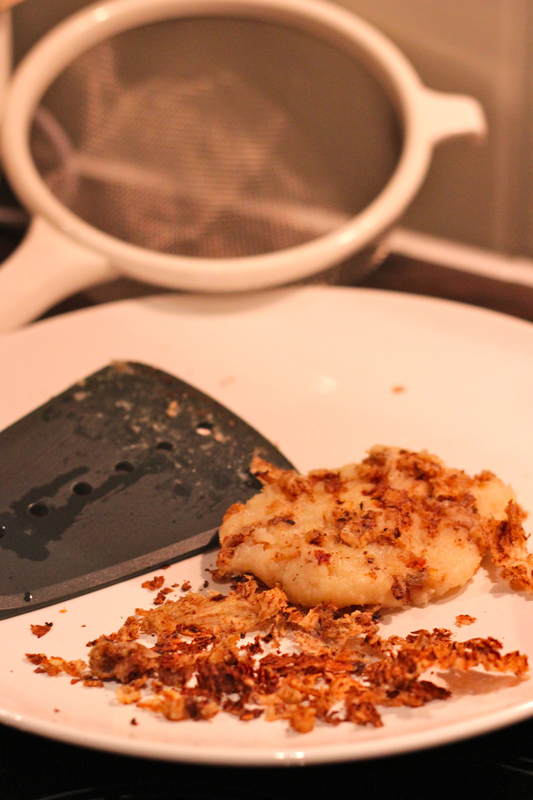 Pan fry until lightly caramelised. ← Proper Food Is So. Amazing.